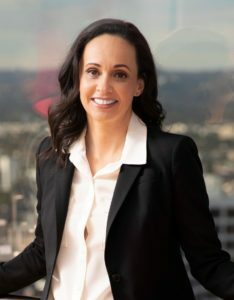 Jessica Millan Patterson is a wife, mother, and the first female and first Latina Chairwoman in the history of the California Republican Party (CRP). She is known for her get-things-done, no-nonsense style. Patterson first became involved with the party as a volunteer in southeast Los Angeles County and was ultimately elected Chairwoman because of her visionary leadership, grassroots success, experience as a political strategist, communicator, and fundraiser. She was endorsed by an overwhelming majority of Republican leaders at the national, state and local levels. Previously, Patterson was CEO of California Trailblazers, an organization she co-founded, that recruits, trains and helps elect Republican candidates for state legislative office. The Trailblazers organization was modeled after the national Young Guns program, created by House Republican Leader Kevin McCarthy. The program supported over 160 candidates and helped facilitate over $6 million in independent expenditures to Republican candidates. Patterson grew up in Hacienda Heights and Montebello in East Los Angeles County, getting her start in politics in high school as a volunteer for former Governor Pete Wilson. She gained valuable organizing and operational experience volunteering at the Los Angeles Republican Party headquarters in Hacienda Heights. Following an internship with Assemblymember Bob Pacheco, Patterson served as an intern for the CRP and was later appointed Executive Director of the Ventura County Republican Party. In partnership with her central committee, Jessica played a key role in Ventura County’s recognition as “Best Overall County Party” in 2004. In 2006, Patterson was a Regional Political Director for Governor Arnold Schwarzenegger’s landslide re-election effort. She was the Nevada Victory Director in 2008 for John McCain for President. Patterson served as the statewide Field Director for Meg Whitman for Governor and California Victory Director in 2010 and 2012 with the CRP. Patterson is a graduate and member of the Board of Directors for the Marian Bergeson Series, a training program designed to recruit and train the next generation of Republican women in California politics. She is married to Wes Patterson a non-profit fundraiser. They live with their daughters in the shadow of the Ronald Reagan Presidential Library in Simi Valley, where they cast their vote each election day. RSVP Deadline is Tuesday, April 9, 2019, at 4:00 p.m. Substitution Available with Reservation Only. No Substitutions at Event.